MADRAS LAVALUCIDA E' UN BRILLANTANTE PER TUTTI I TIPI DI PAVIMENTI, NE FACILITA NOTEVOLMENTE LA PULIZIA QUOTIDIANA PERCHE' NON LASCIA STRATI CEROSI VISIBILI E QUINDI NON SI SEGNA. INIBISCE L'ADESIONE DI SPORCO E POLVERE, PROTEGGENDO DA USURA, ABRASIONE E STRIATURE.IDEALE PER MANTENERE PAVIMENTI CERATI SENZA CREARE ACCUMULI. 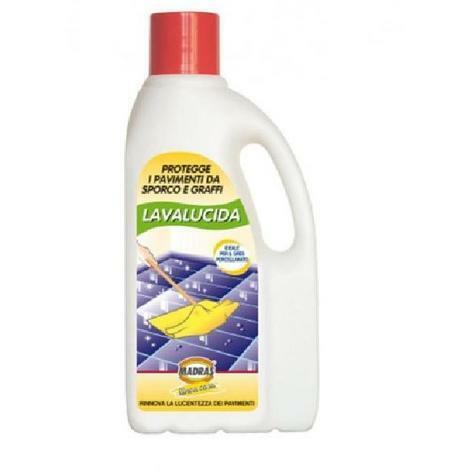 VIENE UTILIZZATO SU QUALSIASI TIPO DI PAVIMENTO ANCHE SINTETICI O DELICATI. LAVALUCIDA... LA CERA CHE NON C'E! !